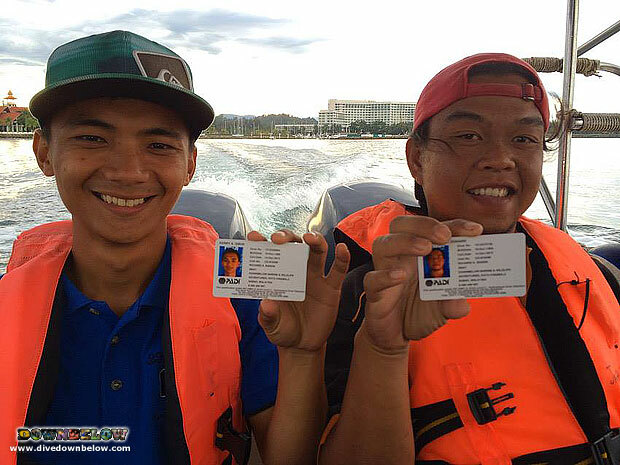 A day to remember for our local PADI Divemaster Trainees, Mac and Kerri! Home/News, Professional Diving Internships/A day to remember for our local PADI Divemaster Trainees, Mac and Kerri! Downbelow created a program to sponsor local Sabahans interested in becoming professionals in the exciting industry of scuba diving and live the diving dream! Our 1-year incentive program, ‘Work For a Career’, is to offer an opportunity not many of the local Sabahan community would otherwise experience. We are passionate in the growth of our mission to support the local community to support themselves. Mac and Kerry are two such members of our island staff team who are under the program to become PADI professionals as their colleagues have done before them. Our PADI 5 Star IDC dive centre is located on Gaya Island, a 10-minute speedboat ride off the coast of Kota Kinabalu, and our highly experienced team of full time PADI professionals acquired their professional dive training through Downbelow too. Mac and Kerry, now qualified PADI Open Water divers, are looking forward to continue their Go PRO scuba diving journey and within a year will be accomplished PADI Divemasters with the highest standard of dive education and training. Not only will they certify as a PADI Divemaster, they will be exposed to the valuable insight of dive operations and the business of the scuba diving industry. This knowledge will benefit them in the progression of their career in this industry because experience is so highly valued to any employer. Continuing their career with Downbelow will be a fantastic choice they won’t regret. The experience acquired while working within the industry after a year of their ‘Work For a Career’ program will prepare them to be confident in their abilities as a responsible PADI professional. Downbelow will always support Mac and Kerri to live the diving dream! By Joanne Swann|2014-01-13T10:49:36+08:00January 13th, 2014|News, Professional Diving Internships|Comments Off on A day to remember for our local PADI Divemaster Trainees, Mac and Kerri!